SINGAPORE - Three of the four Taiwanese men who were charged with receiving stolen money this month were taken to locations in Geylang and Parklane Shopping Centre by the police on Wednesday (July 19). The scams resulted in a loss of over $800,000 for the victims. 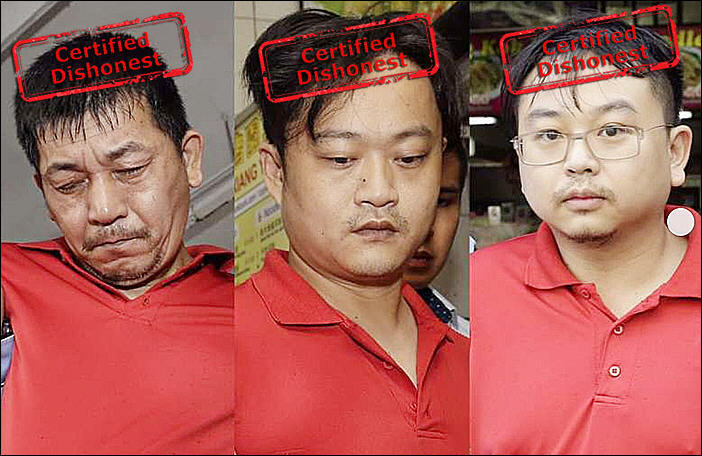 Huang Ying-Chun, 52, Chen Peng-Yu, 34, and Hsieh Teng-Chia, 30, were seen arriving in separate, unmarked police cars at a coffee shop in Lorong 12, Geylang on Wednesday morning. All three were in hand and leg restraints, and brought individually to the toilet area of the coffee shop by officers. They were later taken to the men's toilet on the first floor of Parklane Shopping Centre. It is believed the suspects used the cubicles in some of the alleged transactions. Other places they were taken to on Wednesday included carparks and telephone booths. The Straits Times understands that the case involves cooperation between the police forces of Taiwan and Singapore. Huang had been charged with receiving $150,000 at about 6pm on July 5 in Lorong 40, Geylang. The prosecution said that he is "believed to be involved in a series of scam cases". Chen stands accused of receiving $75,000 from a person named Koh Eng Tiong, together with Huang, on July 7. Done "in furtherance of the common intention" of the group, the transaction was said to have taken place at around 10am, at a block in Hougang Avenue 4, according to court documents. Both Huang and Chen were charged on July 8. On July 10, Hsieh was charged with receiving $75,000 from Koh as well. The alleged crime took place at the same block in Hougang, between 10am and 11am. The fourth man, Chen You-Jeng, 33, is charged with receiving $75,000 as well from Koh, between July 5 and 7. The location was not stated in court documents. The case came to light when Huang was arrested a day after a 55-year-old woman reported losing about $225,000 after taking a call from an unknown person claiming to be a police officer. She was allegedly told she was being investigated by the authorities for money laundering offences. Her call was then transferred to another unknown person, who said he was a police officer from a foreign country. The woman was given a link to an e-service website supposedly from the Singapore Police Force, and allegedly instructed to key in her Internet banking details. She later realised her bank account had been accessed illegally without her knowledge and about $225,000 had been transferred to unknown bank accounts. According to a police statement earlier this month, preliminary investigations showed that Huang is believed to be involved in at least 10 other similar cases. If convicted of the offence of dishonestly receiving stolen property, the men could be jailed for up to five years and fined. SINGAPORE - Enticed by a monthly salary of $2,700, a Taiwanese man came to Singapore to work as a runner for a crime syndicate which cheated seven victims out of nearly $1 million in a police impersonation scam. The victims include an 82-year-old Singaporean man who lost $650,000 after being conned into handing over his bank details. On Monday (June 4), Huang Ying-Chun, 53, was sentenced to 6½ years' jail for his role in the operation. Huang was recruited last June by a man known only as Ah Fei. He was told to go to Singapore and collect and hand over "documents" as instructed. He arrived on June 21 of last year with co-accused Chen Peng-Yu, 34. But the next day, he realised that the documents were actually bundles of cash - namely $50,000 from a man who had fallen victim to a phone call asking him to give his bank account details to the police. Although Huang had reason to suspect that he was involved in a crime, he continued to work as a runner for the syndicate, the court heard. This modus operandi was repeated as the syndicate targeted another six victims - including 82-year-old Tan Kok Phuang, who was cheated on nine occasions over nine consecutive days. Most of the $650,000 he lost was handed over in batches of $75,000. In all the cases, the victims had their money transferred to unrelated third parties, who were then instructed by syndicate operatives pretending to be police, to withdraw the cash and hand it to Huang and his co-accused. Of the $957,000 collected by the syndicate, only $1,050 has been recovered. Huang and five others - mostly suspected runners - have been arrested, though court documents did not reveal how. Huang, who was arrested last July, is the first to be dealt with in the case. Deputy Public Prosecutor Lee Ti-Ting said Huang was motivated by greed as he was in financial difficulties. She added that most of the victims, who were aged 50 to 82, were elderly. She also said that the sole purpose of Huang's stay in Singapore was for criminal purposes. She pointed out that in 2016, there were reportedly 487 police impersonation scams which cheated victims out of a total of S$23 million and that it is "notoriously difficult" to investigate international syndicates. In mitigation, Huang told the court in Mandarin that he has two elderly parents and that his mother has been suffering from depression. He also said through an interpreter: "I'm very remorseful, please give me one last chance to turn over a new leaf." District Judge Ng Peng Hong said that he had to "send a strong signal" to foreigners that Singapore "is not a place you can commit offences and get away with it lightly". For dealing with the benefits of criminal conduct, Huang could have faced up to 10 years in jail, with a fine of up to $500,000. SINGAPORE - Two Taiwanese men were jailed on Tuesday (Sept 4) for their role in police impersonation scams here, in which their victims were conned into handing over up to $185,000 in the belief that they were involved in money laundering cases and other serious offences. The oldest victim was 83 years old when the offences were committed last year and the youngest, 51. For their roles, Hsieh Teng-Chia, 31, was jailed two years and nine months, while 34-year-old Chen You-Jeng was jailed three years. The men had each pleaded guilty last month to one count of dealing with the benefits of criminal activities. Two of their fellow Taiwanese syndicate members have also been apprehended. Huang Ying-Chun, 53, has been dealt with in court, while the case involving Chen Peng-Yu, 35, is still pending. Deputy Public Prosecutor Ryan Lim told the court that between June 15 and July 6 last year, the victims received phone calls from people claiming to be police officers in China or Singapore. "These callers convinced the victims and other involved parties that they were involved in money laundering cases, or in some other serious offences, which were being investigated in China," he said. The victims were told that their bank accounts were implicated, and they had to cooperate with the callers' instructions. They were then cheated into providing their bank account details, which the scammers used to withdraw money without their knowledge. There were also other parties who were pressured into acting as mules, withdrawing money that was transferred into their accounts, and handing the cash over to the Taiwanese men in Singapore. Hsieh's role in the scams started in early 2017 after he met Chen You-Jeng and told him over drinks that he was short on cash. Chen You-Jeng then recruited him into the syndicate's operations, promising him about NTD$75,000 (S$3,300) for a month's work. The duo arrived in Singapore on July 5 last year and received instructions through messaging app Telegram. That very day, $10,000 was transferred out of a victim's bank account into one of the mules' accounts. The mule was instructed to withdraw it and hand it over to Huang at Geylang Lorong 17. Huang collected the money, and then left it in the toilet at a Geylang Lorong 12 eatery. From there, Hsieh collected the money and left it at another toilet in a coffee shop in Geylang Lorong 10. Chen Peng-Yu allegedly later collected the cash, the court heard. A similar method was used in three other incidents in other locations over the next two days. The total sum involved in the four incidents came up to $185,000. On July 7, Chen Peng-Yu and Chen You-Jeng checked into Marina Bay Sands. There, Chen Peng-Yu consolidated the money they had taken before handing it over to another member of the syndicate. No restitution has been made. In sentencing, District Judge Salina Ishak said the Taiwanese duo knowingly came to Singapore with the intention to commit the crime. She also noted the increasing prevalence of such police impersonation scams. According to the police mid-year crime statistics released in August, cases involving scammers claiming to be officials from China jumped more than 200 per cent, from 58 cases in the first six months of 2017 to 182 cases in the same period this year.